A book for understanding Creation and Evolution in a non-sectarian manner. Describes source of gravity and electricity. Disputes the big bang theory. Describes a process which results in the formation of pure crystal. 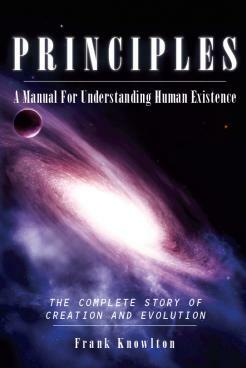 Describes how and why mankind was created and explains the future of mankind. Promotes space travel and technology. Explains the extinction of dinosaur animals. Explains the complete process for the formation of coal. Explains who built the pyramids in Egypt. Describes the origin of American Indians. Reveals new theory on fabled Atlantis. Is a study guide to both The Bible and The Principles of Nature – Her Divine Revelation. Frank Knowlton lives in the upper Hudson Valley in upstate NY. He has an innate scientific and metaphysical inclination, and enjoys self-guided study and research in various areas. He has strong interests in health and conservation and has obtained academic degrees including Physical Therapy Assistant, Water Quality Monitoring and Cayce-Reilly Massage Therapist. He is a “seeker”; open-minded and receptive to innovative and futuristic ways of thinking about the earth and mankind.